With my father in the Air Force, my family never lived near our extended family when I was growing up. Visiting grandparents, aunts, uncles, and cousins was typically a one time a year event. I always loved Sunday at my Nanny’s house. After church the entire clan would go back to her house for a feast. A feast that always included my favorite childhood dessert, Mississippi Mud. I remember her saying once that she thought about making a different cake but didn’t because she knew that Mississippi Mud was my favorite. As an adult, I don’t make this very often because, try as I may, it just is never as good as my Nanny made. If you aren’t familiar with Mississippi Mud, you may question the absence of a rising agent in the recipe. It is not a typo. You use all purpose flour and do not add baking powder or baking soda. 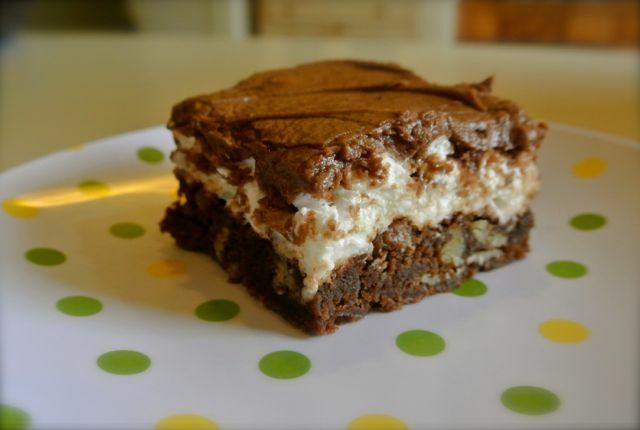 Mississippi Mud is meant to be thick and gooey, not light and fluffy. Remove from oven & top with one bag mini marshmallows. Return to oven until marshmallows are melted & just about to toast. Place all ingredients in bowl & mix together. OMG Loree, this looks insanely decadent, and I must make this in the very near future. Good thing there’s a covered dish happening at church soon!